When trends come out, I get iffy about them and it takes me a couple of months to warm up to them. Before I hop on, I want to absolutely make sure I’m on board. The same goes for wearing kicks with normal clothes. Somehow I made it manage with this look and I kinda love it. Going into 2017 I have been reading that kicks are here to stay and we can say buhbye to 4 inch heels #ptl! Comfort is where we are headed and I so believe in not making your feet bleed. Sadly these kicks JUST got sold out but I linked a similar pair here. I love matching these kicks with this scarf to tie in the navy color. Cheers y’all to 2017! I was going to work on a weekend post BUT I am not sure. We are leaving out of the country from Hawaii to somewhere exciting so I will see how much I can get done on the plane. The time difference is like 15 hours so I will be pretty off. If I don’t see you this weekend, I will see you in the New Year with a fresh post on Monday! “Just Do It” has stuck with me. Honestly, this fitness post is mainly for me to keep me accountable for the New Year lol. I was in a good healthy routine at the beginning of the year, working out at least 3 time a week, and making healthy choices. I have no excuse as to why I fell off and as cliche as it sounds, 2017 is when I am getting my booty back into it. I think over the years of my fitness journey, I have learned what motivates me and what does not. I wanted to share below incase you are also on the struggle bus like me! Schedule: Make it a date and you won’t miss it. Our schedules get so busy that if I don’t set a routine on when to go, I won’t. By myself: Working out alone is no fun. I love catching up with people and working out is the perfect place to do so. Crowded gym: I think the worst thing ever is showing up when there are a million and one people in the gym fighting over machines. I try going around lunch time to avoid the crowds. I would love to hear tips on what motivates and unmotivates you. Today is so fitting to talk about fitness since we are waking up for a sunrise hike to Koko head. We made it into Honolulu yesterday and Kokohead is my absolute favorite thing to do here. Its non stop 1,000 steps straight up the mountain. It’s the most challenging on hour hike and this post seems so fitting! Let’s lash about it, I mean talk about lashes! Earlier this year I was constantly getting eye lash extensions and I had a love / hate relationship with them. I loved loved loved how they looked, how I was able to wake up and walk out of the house, and how much time it saved me when doing my make up. I also loved that I didn’t have to deal with taking off my mascara every night bc honestly that is my least favorite thing to do (but I mean who does enjoy it??) What I didn’t like about the extensions were how high maintenance they were – constantly brushing, staying away from steam rooms, and how they would be bothersome at times. I also didn’t like how they were damaging my eye lashes. Every time I would take them off to let my natural lashes breath a bit, my lashes looks scary and I would call them “tree stumps”. They were so baby and icky. I finally decided I needed invest in my real lashes since I’m going to need these lashes for as long as I live. I did some major research on serums to help them grow and this serum really has helped the process. I don’t use it as consistent as I would like but I think since it’s a little pricey, I become very conservative with it. I did justify my purchase with, if I am going to spend money on eye lashes, I can spend that same money on a serum that would strengthen my lashes. I then use this primer to condition and prep my lashes. I always can tell a huge difference when I get lazy and skip this step #dontskipthisstep! 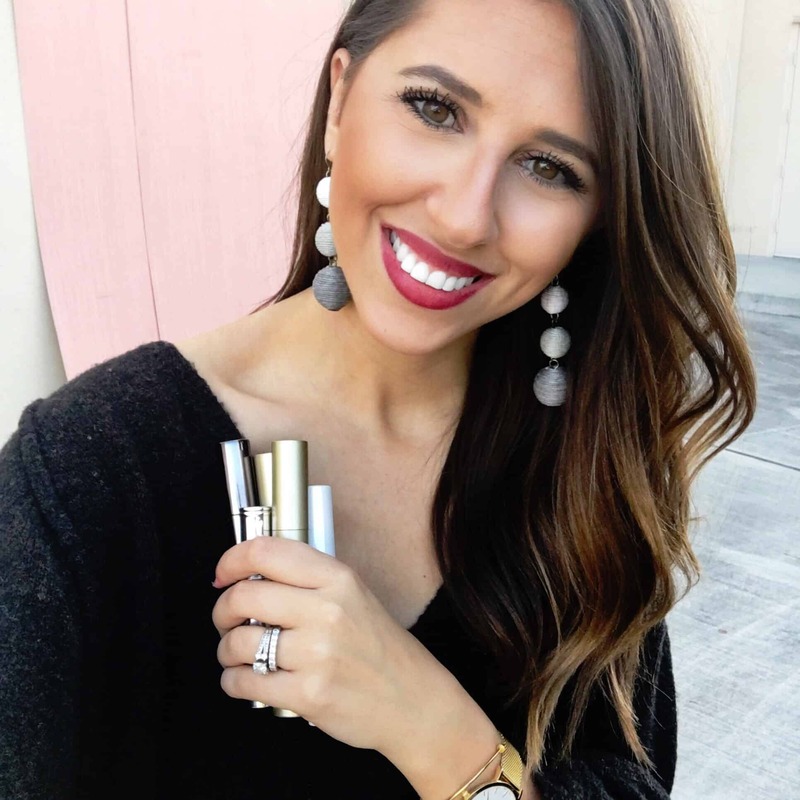 I have been rotating mascaras for the past couple of months trying out a ton of mascaras for this post and these three really stood out to me. I always start with this mascara, then this, and for special occasions or if I am feeling a glam moment, I end with this. Sorry if that was super long winded! I should start a youtube chanel instead of writing a novel but I want to hear from YOU if this is something you would even be interested in. This is actually one of my first beauty posts (highly requested) but I would love to hear what else you are curious about learning about in regards to beauty?! Not sure why I didn’t have this post up yesterday but I wanted to share some of the best end of the year sales happening. There are so many to choose from and majority are mainly a repeat of Cyber Week. Maybe you didn’t get that jacket you had your eye on or got Christmas money for more sweaters, then this sale if for you. Happy shopping darlings!